Summer's here! If you live in the South, like me, it has felt like Summer since May. And if you live in Arizona, you can't wait for Summer to be over already! For me, that means that my morning cup of coffee has now turned into a nice cold cup of iced coffee to help me beat the heat. While normally I stick to a plain (quick) cup of coffee during the week, on the weekends I like to treat myself to a latte or something equally as fancy. This past weekend, I went full on Iggy Azalea (I hope someone get's the Fancy reference) and made myself a spiked frozen latte. Don't worry, my plans for the day included laying by the pool, which means a nice frozen cocktail at 10 am was perfectly acceptable! I was inspired to make myself this nice morning cocktail after my husband came home from New Orleans raving about the frozen Irish coffee he had at a spot called Erin Rose. I didn't really need much convincing after that. Frozen = cold. Irish = boozy. Coffee = coffee. It seemed like the perfect way to start a lazy day by the pool! HOW I MADE IT There are lots of ways to make frozen coffee or espresso drink. Most of them include blending espresso with ice. But that just makes the espresso more watered down. Instead, I poured some milk into an ice cube tray the night before so I would have fresh milk ice cubes to blend with my espresso. Speaking of espresso, I brewed two shots of my favorite Gourmesso pods which work perfectly in my Nespresso machine. Since I was blending the espresso with lots of milk (and other good stuff), I wanted that espresso to really pack a flavor punch. I went with the Ristretto Blend Forte because it's a dark roast with tons of flavor (its a 10 out of 10 for intensity). That way I knew my espresso wasn't going to be overpowered by everything else. Once the espresso had cooled to room temperature, I poured it into the blender with the milk ice cubes. Now for the booze. I took inspiration from the original boozy coffee, the Irish coffee, and added a shot of Baileys Irish Creme to the mix. I also added a shot of Kaluha to really make that coffee flavor pop. And for some extra creaminess, I added a splash of heavy cream. Just a splash. Now I leave the hard part for the blender. It's as simple as making a morning green smoothie! But, soooo much better (and not quite as healthy). I poured it into a nice insulated cup (after I poured it into these glass cups so I could take fancy pictures), then took it with me to the pool. While other's were drinking their Bloody Mary's, I had a delicious frozen latte. This is the perfect frozen cocktail for the Summer, whether that's relaxing by the pool, beach or off on vacation! If you want to make this later in the day (because it's also a great dessert), you can make this with your favorite decaf coffee (you can see more Gourmesso coffee capsules here). Just make sure to pick something that is really rich so that you maintain the delicious coffee flavor! 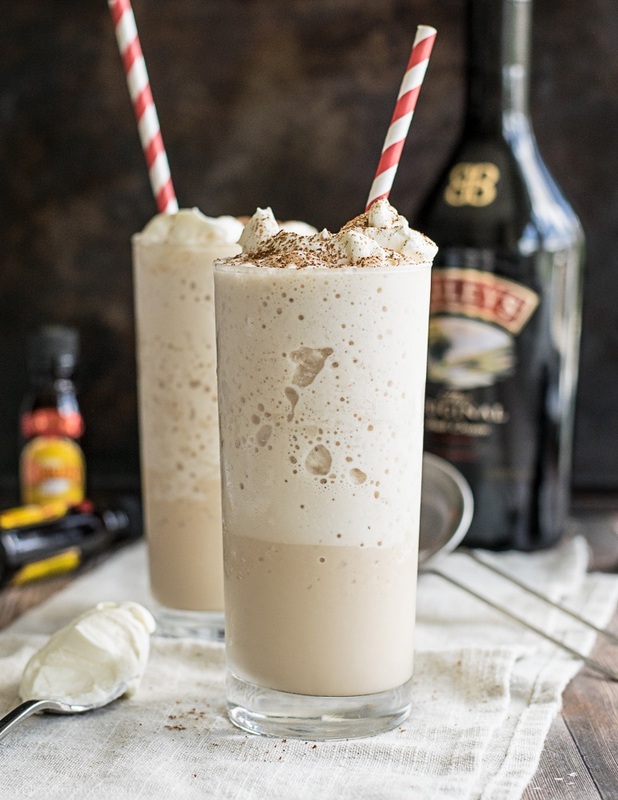 In a blender, add milk ice cubes, espresso cream, Bailey's, and Kahlua and blend until smooth. Pour into two glasses and top with whipped cream.